Each of our Best Organic Dog Food nominees are manufactured in USDA certified organic facilities, meeting the USDA’s strictest guidelines for the sourcing, handling, and processing of foods. For information about what qualifies a dog food as organic, and the truth about product labeling, click here. 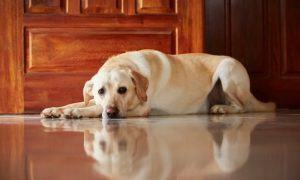 Since their launch in 2000, Castor & Pollux has been a leader in the natural and organic pet food market. 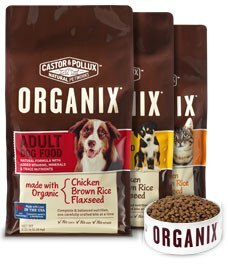 With the introduction of their Organix line of products in 2003, Castor & Pollux made top-quality, all natural, organic pet foods easily available to dog owners around the country. Their USDA Certified Organic manufacturing facility sources only the highest quality, organic ingredients produced without chemical pesticides, synthetic fertilizers, artificial preservatives, or added growth hormones or antibiotics. What’s more, Castor & Pollux Organix recipes contain no corn or wheat, ingredients that are proven sensitive to many dogs. Their dry dog food recipes contain 100% organic, free-range chicken as the number one ingredient, with fresh organic rice, fruits, and vegetables added to provide natural vitamins, minerals, antioxidants, and fiber. Plus, dogs LOVE the taste of Organix foods! In addition to providing top quality organic food for our pets, the company celebrates the love of pets in the family, and is committed to feeding pets in need. 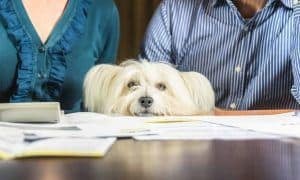 Since its founding, Castor & Pollux has donated more than 3 million meals to dogs and cats and has established its PetWorks Partners program to continue its support of non-profit pet rescue organizations. By Nature Pet Foods was founded in 2006 and is a division of Kent Nutrition Group. Based in Muscatine, Iowa. By Nature provides pet food diets of the highest quality, using only ingredients that deliver supreme nutritional benefits to support a pet’s natural defenses against the effects of aging, illness, physical and environmental stress. The company carries a line of organic dog food (both dry and canned), which are available through pet specialty retailers across the United States. 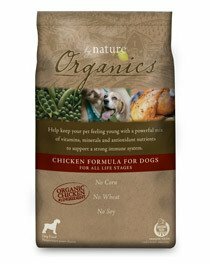 By Nature Organic dog food is certified by the USDA as 100% Organic. Their dry formula lists Organic Chicken as the first ingredient and contains no corn, no wheat, and no soy. Canned formulas like Organic Turkey, Chicken, Chicken with Carrots & Peas, and Chicken & Salmon Stew are nutrient rich and grain free. 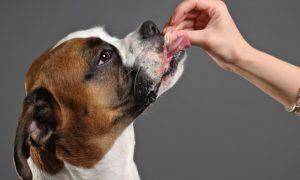 You’re sure to find a flavor that suits your dog’s tastes while feeling good about what you’re feeding your dog. Organic foods are subject to far stricter government standards than other non-organic foods. They contain no GMO’s, no synthetic pesticides, hormones or antibiotics. To learn more about By Nature Organics, visit bynaturepetfoods.com. 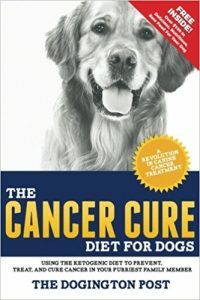 Daryl and Shawna Abrams were constantly searching to feed their pets something we felt was safe, nutritious and clean. After several years of unsuccessfully searching for an organic, healthy line of pet food, they decided to create their own. The West Hollywood, California based company Party Animal was born in 2006. They began working on a line of pet food that was made with only the finest ingredients available. 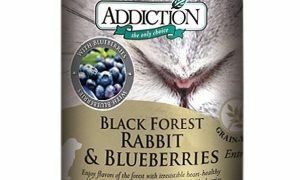 They create formulas that taste great naturally but also provide a hormone and pesticide-free diet for our four legged friends. At Party Animal, foods are produced with fresh top-quality poultry, seafood and meats, which provides a healthy source of protein for your pet. They also use fresh fruits and vegetables such as blueberries, cranberries, zucchini and artichoke to name a few, which are a great source of antioxidants, fiber, vitamins and folic acid. The company takes pride in producing organic and natural dog food that satisfies the primary health concerns of pet owners: delicious clean nutrition and protection for your pets from exposure to toxins and unhealthy ingredients. Pet parents themselves, the folks at Party Animal are committed to producing gourmet dog food for your pets and theirs. All pets deserve to be healthy, and a healthy pet starts with healthy nutrition. 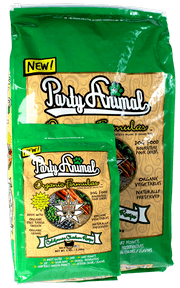 The entire line of Party Animal Pet Food does not contain any by-products, pesticides, antibiotics, fertilizers, preservatives, added salt, artificial colors or flavors. Dog food should not be commercialized. It should be made at home by owners. However, business minded people capitalizing on people’s preference for convenience, started mass producing dog food. But what does this situation entail? 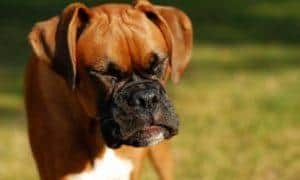 Dog food that is not nutritious and healthy enough for our dogs. Why? Each dog is unique like humans and each require an appropriate diet. However, by mass producing dog food, it is aimed to target every dog, which means, nutrients and minerals are generalized. But because of profit, companies will have limited ingredients otherwise they will lose profit. 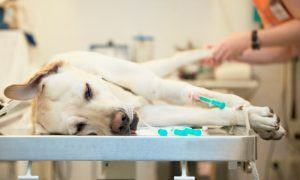 So how can commercialized dog food address or respond to the individual needs of our pet dogs? Makes sense? Now, companies will claim that they have this and that, they do this and that. . .but can we really trust their ads and their labels? Better for us to switch to home made dog food. 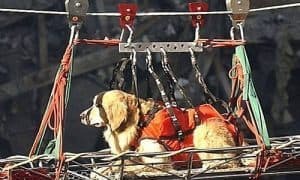 Dogs are safe, they are healthy, we save money. How about others? There has been one that I have used for more then 25 years.